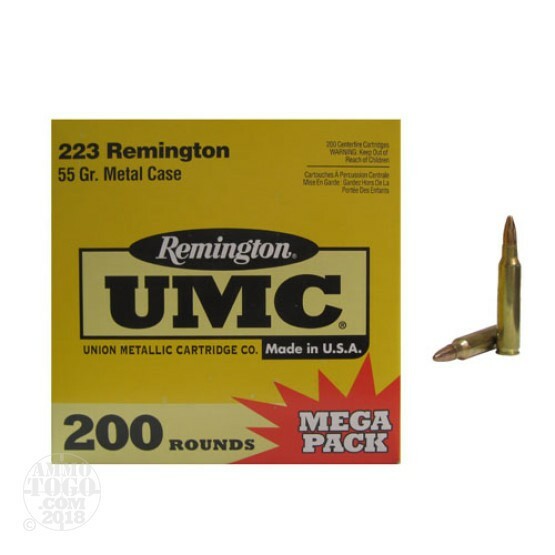 This is .223 Remington UMC Mega Pack 55gr. Full Metal Jacket Ammo. For practice, target shooting and training exercises, UMC centerfire rifle ammunition is loaded with metal case bullets. All UMC rifle loadings are ideal for high volume shooting. This ammo is brass cased, boxer primed and 100% non-corrosive. This is some great plinking ammo for your AR-15 or Mini-14. Muzzle velocity of 1292fps. This ammo is packed in 200rd. value pack boxes.